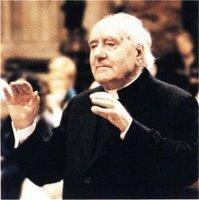 All of the selections we have listened to – and especially in their entirety, where the 16th and 20th centuries stand parallel – agree in confirming the conviction that sacred polyphony, in particular that of what is called the ‘Roman school’, constitutes a heritage that should be preserved with care, kept alive, and made better known, for the benefit not only of the scholars and specialists, but of the ecclesial community as a whole. [...] An authentic updating of sacred music can take place only in the lineage of the great tradition of the past, of Gregorian chant and sacred polyphony. Sandro Magister has a good comment piece this week on it called A Change of Tune in the Vatican – And Not Only in the Secretariat of State in which he analyses Pope Benedict's decition to reinstate Bartolucci as director of the Sistine Choir. Apparently the grand master of the Equestrian Order of the Holy Sepulchre of Jerusalem, said it was "better to have guitars on the altar and rock and roll Masses than empty churches". To which a chorus of responses has pointed out that the two have not proved mutually exclusive.